Note the location of front and rear wheel straps. 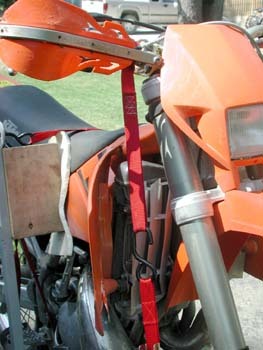 The stabilizer bar pivots so that the strap will go around the bike in an area that is best suited for attaching padding to the sta-bar and free of obstructions or sharp edges. 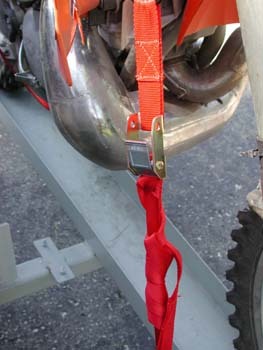 View of stabilizer with strap attached at top. Note the padded wooden block screwed to the stabilizer bar. Ideally, you can customize this block to fit the contour of cycle in the area of contact with a saber saw and then covering with carpet or self-adhesive felt. 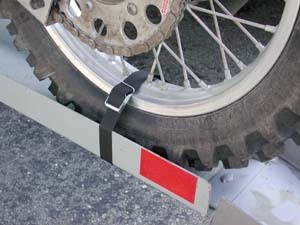 The short lashing straps are ideal for securing the bike’s front and rear wheel. The soft tie at the top will prevent the hook of the cam tie down from leaving marks on the handlebar. 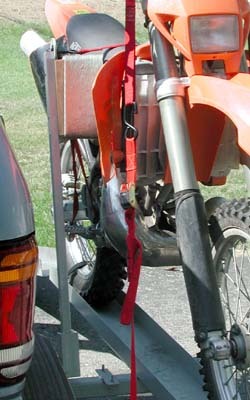 The strap is placed on the right handlebar between the bike and the vehicle. 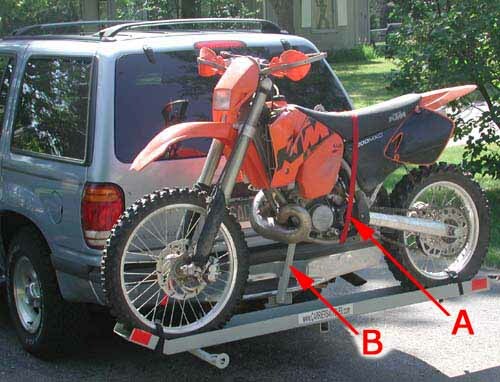 This is best configuration for pulling the bike toward the front wheel chock. The knot tied snug against the cam prevents the possibility of slippage if the cam lock fails. This precaution should also be used on the stabilizer strap. Remember to inspect all straps at each stop or 200 mile intervals.